multi-purpose to a new level with wide projection flexibility and innovative features that enhance user ergonomics and patient comfort. 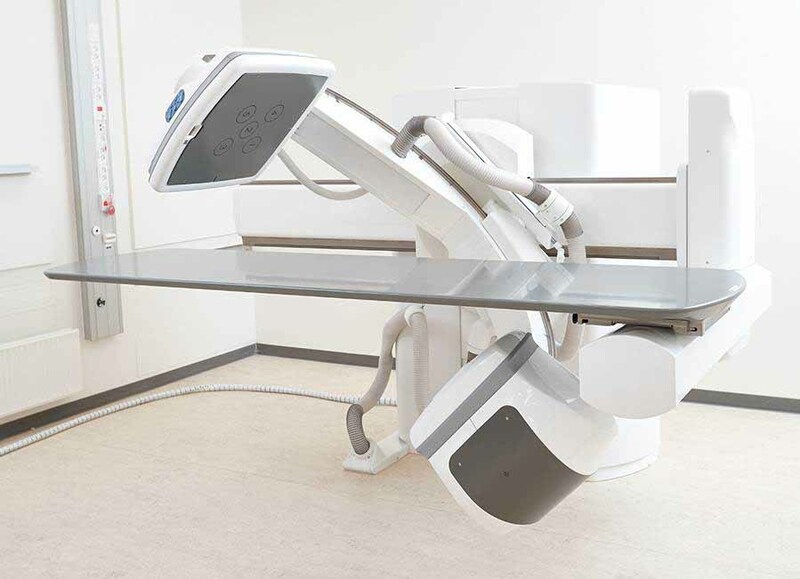 Multi-purpose tilt-C X-ray system which stands out by being a hybrid system that in addition to serial and fluoroscopic imaging, offers a larger range of radiographic imaging capabilities and projection positioning, including true DR imaging. Perform any position you can imagine, and exploit the systems extensive movement ranges. Save for standard procedures. Hence, the built-in in Motion auto-positioning technology enables direct, automatic positioning of the detector and tube to any saved position with all examination parameters pre-set. Save and restore any position – permanently or on-the-fly. Preferred positions can be saved and recalled at any time, for fast and fully automatic positioning. The system operates differently whether the tube is under or over the table (AP and PA position). Switch between these two modes at the press of a button. Best in class SID range together with the highest patient table weight capacity represent a quantum leap forward in terms of versatility and examination excellence. Due to a small footprint, minimum install space is required, while the design maximizes the work areaaround the patient table. Intuitive use and easy access around the table improves efficiency and workflow. Smooth and low noise high speed movements, while allowing to save and restore any position permanently or during examination prove that was designed with user ergonomics in mind. The user can easily choose from multiple beam projections, which reduces the need to re position the patient during the procedure and leads to increased patient comfort. Moreover, allows moving the table out of the beam for reducing dose in e.g. standing DR examinations. Take charge of patient-side procedures with the control console. This easy-to-use console is designed to be used for convenient in-room system management and provides full control of the functions you need during an in-room procedure. Four joysticks and an intuitive user interface allow direct access to key functions such as system positioning, setting and adjusting image parameters and perform specialized movements. Four ergonomic 3-axis joysticks are marked in different colours making it easier for user to visually distinguish the joysticks. The colour on top of the joystick presents the respective colours of the movement controls on the intuitive user interface. For convenient in-room system operation, one joystick delegates collimation control, while the other three are for movement control. Built in sensors in all joysticks secure that they are only active when you want them to be. In Touch technology senses the touch of a finger at the top of the joystick, making this feature seamless, yet effective. Take charge of patient-side procedures in control console. This easy-to-use console places all the functions you need, right at your fingertips. In control provides a convenient way of positioning and controlling the system from within the room. The ergonomic handle and lockable wheels ensure that moving it from a bedside position to a standing examination is no effort at all. Motorized movements mean that the in control console height can be effortlessly and seamlessly adjusted to the individual who is using it – ensuring that an ergonomic work environment is maintained. With the latest Canon detectors and imaging software, digital images have never looked better. The features the detector, which combines outstanding static image capabilities with high sensitivity, high resolution dynamic capabilities. In addition, intuitive Canon software provides sophisticated image processing for premium diagnostic image quality.